Anagarika Dharmapala (Sinhalese: අනගාරික ධර්මපාල; 17 September 1864 – 29 April 1933) was a Sri Lankan Buddhist revivalist and writer. He was one of the founding contributors of non-violent Sinhalese Buddhist nationalism and Buddhism. He was also a pioneer in the revival of Buddhism in India after it had been virtually extinct there for several centuries, and he was the first Buddhist in modern times to preach the Dharma in three continents: Asia, North America, and Europe. Along with Henry Steel Olcott and Helena Blavatsky, the creators of the Theosophical Society, he was a major reformer and revivalist of Ceylonese Buddhism and an important figure in its western transmission. He also inspired a mass movement of South Indian Dalits including Tamils to embrace Buddhism, half a century before B. R. Ambedkar. At the latter stages of his life, he entered the order of Buddhist monks as Venerable Sri Devamitta Dharmapala. Anagarika Dharmapala was born on 17 September 1864 in Matara, Ceylon to Don Carolis Hewavitharana of Hiththetiya, Matara and Mallika Dharmagunawardhana (the daughter of Andiris Perera Dharmagunawardhana), who were among the richest merchants of Ceylon at the time. He was named Don David Hewavitharane. His younger brothers were Dr Charles Alwis Hewavitharana and Edmund Hewavitarne. Ceylon (now Sri Lanka) was a British colony then, so Hewavitarne's state education was an English one: he attended Christian College, Kotte; St Benedict's College, Kotahena; S. Thomas' College, Mutwal and the Colombo Academy (Royal College). Anagarika Dharmapala (seated-centre) at the Mahabodhi Society Headquarters in Calcutta. This was a time of Buddhist revival. In 1875 in New York City, Madame Blavatsky and Colonel Olcott had founded the Theosophical Society. They were both very sympathetic to what they understood of Buddhism, and in 1880 they arrived in Ceylon, declared themselves to be Buddhists, and publicly took the Refuges and Precepts from a prominent Sinhalese bhikkhu. Colonel Olcott kept coming back to Ceylon and devoted himself there to the cause of Buddhist education, eventually setting up more than 300 Buddhist schools, some of which are still in existence. It was in this period that Hewavitarne changed his name to Anagarika Dharmapala. 'Dharmapala' means 'protector of the dharma'. 'Anagarika' means "homeless one". It is a midway status between monk and layperson. As such, he took the eight precepts (refrain from killing, stealing, sexual activity, wrong speech, intoxicating drinks and drugs, eating after noon, entertainments and fashionable attire, and luxurious beds) for life. These eight precepts were commonly taken by Ceylonese laypeople on observance days. But for a person to take them for life was highly unusual. Dharmapala was the first anagarika - that is, a celibate, full-time worker for Buddhism - in modern times. It seems that he took a vow of celibacy at the age of eight and remained faithful to it all his life. Although he wore a yellow robe, it was not of the traditional bhikkhu pattern, and he did not shave his head. He felt that the observance of all the vinaya rules would get in the way of his work, especially as he flew around the world. Neither the title nor the office became popular, but in this role, he "was the model for lay activism in modernist Buddhism." He is considered a bodhisattva in Sri Lanka. Dharmapala eventually broke with Olcott and the Theosophists because of Olcott's stance on universal religion. "One of the important factors in his rejection of theosophy centered on this issue of universalism; the price of Buddhism being assimilated into a non-Buddhist model of truth was ultimately too high for him." 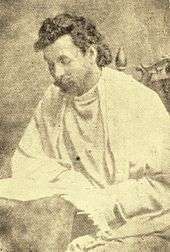 Dharmapala stated that Theosophy was "only consolidating Krishna worship." "To say that all religions have a common foundation only shows the ignorance of the speaker; Dharma alone is supreme to the Buddhist"
At Sarnath in 1933 he was ordained a bhikkhu, and he died at Sarnath in December of the same year, aged 68. 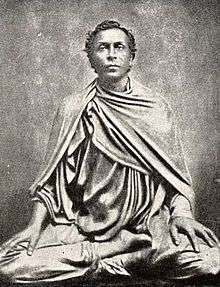 Srimath Anagarika Dharmapala in his middle thirties. A Letter Written By Srimath Dharmapala in 23rd June 1902 to a Friend in Japan. The young Dharmapala helped Colonel Olcott in his work, particularly by acting as his translator. Dharmapala also became quite close to Madame Blavatsky, who advised him to study Pāli and to work for the good of humanity - which is what he did. It was at this time that he changed his name to Dharmapala (meaning "Guardian of the Dharma"). In 1891 Anagarika Dharmapala was on a pilgrimage to the recently restored Mahabodhi Temple, where Siddhartha Gautama - the Buddha - attained enlightenment at Bodh Gaya, India. Here he experienced a shock to find the temple in the hands of a Saivite priest, the Buddha image transformed into a Hindu icon and Buddhists barred from worship. As a result, he began an agitation movement. 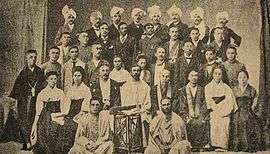 The Maha Bodhi Society at Colombo was founded in 1891 but its offices were soon moved to Calcutta the following year in 1892. One of its primary aims was the restoration to Buddhist control of the Mahabodhi Temple at Bodh Gaya, the chief of the four ancient Buddhist holy sites. To accomplish this, Dharmapala initiated a lawsuit against the Brahmin priests who had held control of the site for centuries. After a protracted struggle, this was successful only after Indian independence (1947) and sixteen years after Dharmapala's own death (1933), with the partial restoration of the site to the management of the Maha Bodhi Society in 1949. It was then the temple management of Bodh Gaya was entrusted to a committee comprised in equal numbers of Hindus and Buddhists. Maha Bodhi Society centers were set up in many Indian cities, and this had the effect of raising Indian consciousness about Buddhism. Converts were made mostly among the educated, but also among some low caste Indians in the south. Voice of Srimath Anagarika Dharmapala / Excerpt from a Public Speech. Voice of Srimath Anagarika Dharmapala / Excerpt from a Dhamma Deshana. Due to the efforts of Dharmapala, the site of the Buddha's parinibbana (physical death) at Kushinagar has once again become a major attraction for Buddhists, as it was for many centuries previously. Mahabodhi Movement in 1890s held the Muslim Rule in India responsible for the decay of Buddhism in India. Anagarika Dharmapala did not hesitate to lay the chief blame for the decline of Buddhism in India at the door of Muslim fanaticism. In 1893 Dharmapala was invited to attend the World Parliament of Religions in Chicago as a representative of "Southern Buddhism" - which was the term applied at that time to the Theravada. 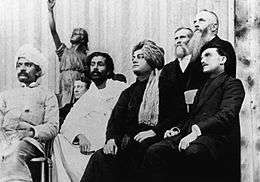 There he met Swami Vivekananda and got on very well with him. Like Swami Vivekananda, he was a great success at the Parliament and received a fair bit of media attention. By his early thirties he was already a global figure, continuing to travel and give lectures and establish viharas around the world during the next forty years. At the same time he concentrated on establishing schools and hospitals in Ceylon and building temples and viharas in India. Among the most important of the temples he built was one at Sarnath, where the Buddha first taught. On returning to India via Hawaii, he met Mary E. Foster, a descendant of King Kamehameha who had emotional problems. Dharmapala consoled her using Buddhist techniques; in return, she granted him an enormous donation of over one million rupees (over $2.7 million in 2010 dollars, but worth much more due to low labor costs in India). 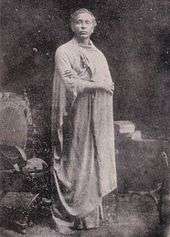 In 1897 he converted Miranda de Souza Canavarro who as "Sister Sanghamitta" came to establish a school in Ceylon. Dharmapala's voluminous diaries have been published, and he also wrote some memoirs. The term 'Protestant Buddhism,' coined by scholar Gananath Obeyesekere, is often applied to Dharmapala's form of Buddhism. It is Protestant in two ways. First, it is influenced by Protestant ideals such as freedom from religious institutions, freedom of conscience, and focus on individual interior experience. Second, it is in itself a protest against claims of Christian superiority, colonialism, and Christian missionary work aimed at weakening Buddhism. "Its salient characteristic is the importance it assigns to the laity." It arose among the new, literate, middle class centered in Colombo. The term 'Buddhist modernism' is used to describe forms of Buddhism that suited the modern world, usually influenced by European enlightenment thinking, and often adapted by Asian Buddhists as a counter to claims of European or Christian superiority. Buddhist modernists emphasize certain aspects of traditional Buddhism, while de-emphasizing others. Some of the characteristics of Buddhist modernism are: importance of the laity as against the sangha; rationality and de-emphasis of supernatural and mythological aspects; consistency with (and anticipation of) modern science; emphasis on spontaneity, creativity, and intuition; democratic, anti-institutional character; emphasis on meditation over devotional and ceremonial actions. Most of Dharmapala's works are collected in Return to Righteousness: A Collection of Speeches, Essays, and Letters of the Anagarika Dharmapala. (Edited by Ananda Guruge. Colombo: Ministry of Education and Cultural Affairs, 1965). Anagarika Dharmapala at the Parliament of World Religions. From left to right: Virchand Gandhi, Anagarika Dharmapala, Swami Vivekananda, and G. Bonet Maury. This paper was read to a crowded session of the Parliament of World Religions in Chicago, 18 September 1893. At this early stage of his career, Dharmapala was concerned with making Buddhism palatable to his Western audience. This talk is full of references to science, the European Enlightenment, and Christianity. While presenting Buddhism in these familiar terms, he also hints that it is superior to any philosophy of the West. In addition, he spends considerable time discussing the ideal Buddhist polity under Asoka and the Buddha's ethics for laypeople. Buddhism was often portrayed in the West, especially by Christian missionaries, as pessimistic, nihilistic, and passive. One of Dharmapala's main concerns was to counter such claims, and this concern is especially evident in this essay. In the later stages of his career, Dharmapala's vociferous anti-Christian tone is more evident. Dharmapala must be understood in the context of British colonization of Ceylon and the presence of Christian missionaries there. This work is a good example of "Protestant Buddhism," as described above. Darwin's theory of evolution was the cutting edge of science during Dharmapala's life. As part of his attempt to show that Buddhism is consistent with modern science, he was especially concerned with evolution. This bright, beautiful island was made into a Paradise by the Aryan Sinhalese before its destruction was brought about by the barbaric vandals. Its people did not know irreligion ... Christianity and polytheism [i.e. Hinduism] are responsible for the vulgar practices of killing animals, stealing, prostitution, licentiousness, lying and drunkenness ... The ancient, historic, refined people, under the diabolism of vicious paganism, introduced by the British administrators, are now declining slowly away. He once praised the normal Tamil vadai seller for his courage and blamed the Sinhalese people who were lazy and called upon them to rise. He strongly protested against the killing of cattle and eating of beef. In short, Dharmapala's reasons for rejecting British imperialism were not political or economic. They were religious: above all, the Sinhala nation is the historical custodian of Buddhism. The Muhammedans, an alien people, ... by shylockian methods become prosperous like Jews. The Sinhala sons of the soil, whose ancestors for 2358 years had shed rivers of blood to keep the country free of alien invaders ... are in the eyes of the British only vagabonds. The Alien South Indian Muhammedan come to Ceylon, sees the neglected villager, without any experience in trade ... and the result is that the Muhammedan thrives and the sons of the soil go to the wall. In short, Dharmapala and his associates very much encouraged and contributed to something aptly called the "ethnocratic state." As some of the quotes above demonstrate, Dharmapala sometimes resorted to racist language. Here are a couple of other examples. At one point he refers to "the semisavage half-animal people of Africa" He claims that "...all that [Christian missionaries] can offer are the myths of Canaan and Galilee which had their origin in the backwash of Arabia." Dharmapala believed that Sinhalese are a pure Aryan race with unmixed blood. He claimed that Sinhalese women must take care and to avoid Mischling with minority races of the country. ↑ Epasinghe, Premasara (19 September 2013). "The Dharmapala legacy". Daily News. Archived from the original on 12 September 2014. Retrieved 18 September 2014. ↑ Harvey, Peter. 1990. An Introduction to Buddhism: Teachings, History, and Practices. Cambridge: Cambridge University Press. 208. ↑ McMahan, David L. 2008. The Making of Buddhist Modernism. Oxford: Oxford University Press. 291. ↑ Dipak K. Barua, "Buddha Gaya Temple: its history"
↑ Prothero, Stephen. 1996b. The White Buddhist: The Asian Odyssey of Henry Steel Olcott. Bloomington: Indiana University Press. 167. ↑ "A Close View of Encounter between British Burma and British Bengal" (PDF). Archived from the original (PDF) on 7 June 2007. Retrieved 2015-09-27. Trevithick, Alan (2006). The revival of Buddhist pilgrimage at Bodh Gaya (1811-1949): Anagarika Dharmapala and the Mahabodhi Temple. ISBN 978-81-208-3107-0. Kloppenborg, Ria. 1992. "The Anagarika Dharmapala (1864-1933) and the Puritan Pattern". Nederlands Theologisch Tijdschrift, 46:4, 277-283.